In France you will be warmly welcomed. Most of the citizens have a relationship with cycling, even though it’s a minority that uses them in their holidays. That comes with a great deal of respect and understanding to the cycling tourists. France is a great country, where every region is different from one another with its very own features. You will find big mountains to climb, or lighter hilly areas with running water and small roads alongside the growing fields. France is known for their small roads, which you properly will have all to yourself. The food is a pleasure and the wine is a matter of course. Are you traveling in July or August you will find the highest temperatures in the southern parts. Despite the high temperatures, we don’t experience visitors having troubles with it when there are traveling. Just take precautions and bring a cap to cover your head, and the wind will cool you down. Also, you can copy the locals and take a couple hours off in the siesta hours. The Rhine Plain and Route de Vin along the Vosges Mountains. An easy cycling holiday where everyone can join, and where your senses are constantly challenged. Contrasts. 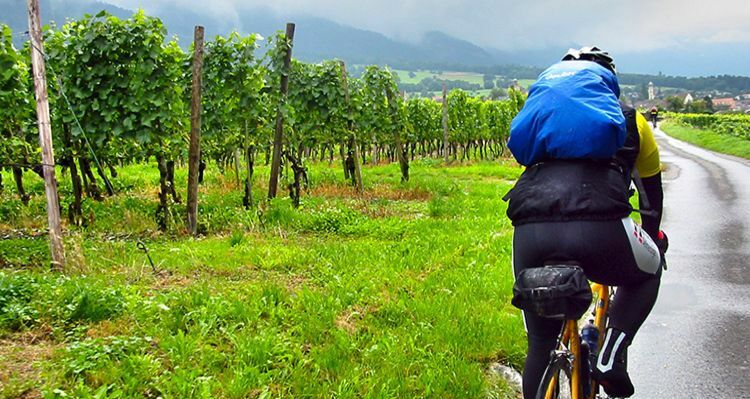 Easy cycling through an abundance of France's largest vineyards combined with more hilly cycling routes through the purely idyllic and beautiful scenery on the eastern bank of the Gironde River.